Happy Fourth – Support Your Local Rehabber! 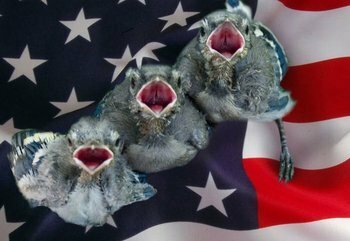 No, these are not highly-trained nestling Blue Jays posing artfully on an American flag. They’re just really cute orphaned Blue Jays who were raised and eventually released by Kim Doner of WING-IT in Tulsa. And Kim – besides being a great rehabber – knows how to Photoshop. It’s summer, so rehabbers all over the country are being deluged with babies as well as the usual injured adults. These saintly people are are stressed out, sleep deprived, and working insane hours, but they somehow manage to stick to the feeding/medical treatment schedules and give all kinds of wild creatures a second chance at life. Google your town, county, or state, find your closest wildlife rehabilitator, and send them a donation. Ask if they need help. Why not celebrate the 4th of July by helping the struggling wildlife (and wildlife rehabbers) of our country? Should Restored or Rescued Birds Count? Where Are You Birding This Second Weekend of October 2011? What is the American Bird Conservancy Anyway?